The other thing I learned yesterday is that Chick-Fil-A doesn't have hot chocolate. Boo. So, I went to McDonald's, and ordered a medium hot chocolate. They informed me that their specialty coffee machine wasn't working. So, I ordered again louder (surely my voice was garbled on that speaker). She told me again about the machine. I said, "..so the hot chocolate is a specialty coffee?" "Yes." Hmm. So, I went to Starbucks for the primo hot chocolate. At least they knew what I was talking about. I was starting to wonder if I made up some vision of warm chocolate to drink. Great invention, btw. 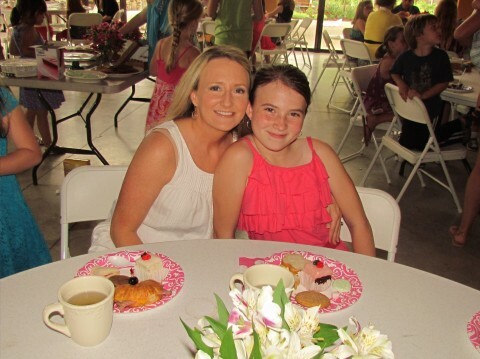 Yesterday was the Mother Daughter Tea, and we had the best flowers, punch, and treats. Three people brought petit fours..all delish. No, I didn't try them all..but Mary Claire did! So good, she ran out of insulin. She's not making it a full three days anymore. I have to be careful. She had to bring home her plate of goodies..at least she had an egg salad sandwich! Tonight was Bunco, so I got to see all the cool kids. Everyone has something fun going on! I got to share about my house. Yay me..and my temporary housing! Kathy had made these awesome rugs for her deck..they are canvas drop cloths she got at Lowe's, painted, and sealed! They were beautiful. She did a large one and a coordinating smaller one. I want one! They kinda look like this (and there's a tutorial!). She's a good designer, no? This picture is not mine, I have to say first. It says "g With Angels" I pinned it, but it's Love. As in my wall paper on my phone, and what I choose to look at. Over and over. ; ) God loves us..why else would He give life to these gorgeous things? and things that are here so briefly? Beautiful. There's no real (visible) progress on the house. And I'm tired out from rolling dice. ; ) Enjoy that piece of gorgeousness since I'm headed south. Night, ya'll!